Based on the number of gilded temples and Buddha images I saw from Yangon to Pindaya Caves, it was easy to discern the obvious: Buddhism is the major religion in Myanmar. However, our guide kept saying that Buddhism is not a religion but a way of life. So I started to reflect on this statement. From the onset, I asked our guide if there's a topic that's off limits. He said nothing is off limits except for taking pictures of people in uniform, the military. I suppose the things that really left an impact on me are the people and culture. I could not comment on what was happening in another part of the country, but the locals that we had contact with were happy to share their moments with the camera. So, I'd like to share even a tiny fraction of the country's narrative like men wearing skirts called longyi and men, women, children and babies wearing a yellow paste called thanaka on the faces to protect their skin from the sun, and the traditional way of making a living or making things where everything is made by hand. On the way to Inle Lake, we stopped and visited a family-run paper umbrella workshop. The lady pictured below showed us the first process in the papermaking by pounding the mulberry bark that was already boiled and soaked in water overnight. The soft pulp was rubbed into a small bowl of water and poured into a rectangular frame, spread evenly and decorated with leaves and bougainvillea petals, let it settle for a couple of minutes before putting under the sun to dry. Her uncle showed us that everything is completely made by hand from the bamboo handle to the pawl. I had unfounded expectations of Inle Lake. I did not expect any big hotels around the lake, but the hotel we stayed in was literally built on the water’s edge. We boarded the traditional long-tail boat from there to explore Inle Lake. Our motorized boat passed through a field of hyacinth before seeing the main show: the fishermen unique style of fishing where they row with one-leg while using their hands to put their catch in the basket. Intha fishermen row with one leg as they toss their nets into the lake to get the catch of the day, or waiting for tourists to take their picture. A man filling his boat with soil for planting. There are interesting sites in and around the lake like the villages on stilt, the jumping cat monastery, and a cooking school with a cat sanctuary, and the floating gardens. Our traditional long-tail boat took us to the waterways of a stilt house community in the lake. Here we witnessed everyday moments of life, women laying out fish to dry and kids joyfully fetching water. Of course, our picturesque tour was punctuated by plenty of retail opportunities. We stopped at a silk factory/workshop where we watched a woman twists and breaks a lotus stem to extract sap and then rubbed it into a long string to produce a very delicate silk thread. We then stepped into a world of wooden looms to see weaving demonstrations. The finished products (very expensive scarves) were available for sale at the shop. We visited the Jumping Cat Monastery before visiting a silversmith or a silver jewelry shop. Aside from the presence of cats, what's unique about this place is the teak wood pillars and that women are not allowed to step into the raised platform in the middle. Only men are allowed to approach the middle platform to bring offerings. I'm not really into buying stuff and souvenirs and skeptical about seeing locals in colorful native garb hanging out at a tourist place asking tourists to take a selfie with them or take their picture for a fee. I also heard stories about the Long Neck Ladies being exploited for tourism, but I was glad that we stopped by the Kayan-run weaving workshop to see the Long Neck Lady(s) because I think they have a fascinating story why they wear the coiled rings around their neck. We wove through the massive maze of floating gardens where farmers grow tomatoes, pumpkins, and other produce. We passed by boats in the narrow water canals overflowing with chives. Speaking of chives, another activity that I participated in was a cooking class at the Inle Heritage House, where we picked our own vegetables and herbs fresh from the gardens. 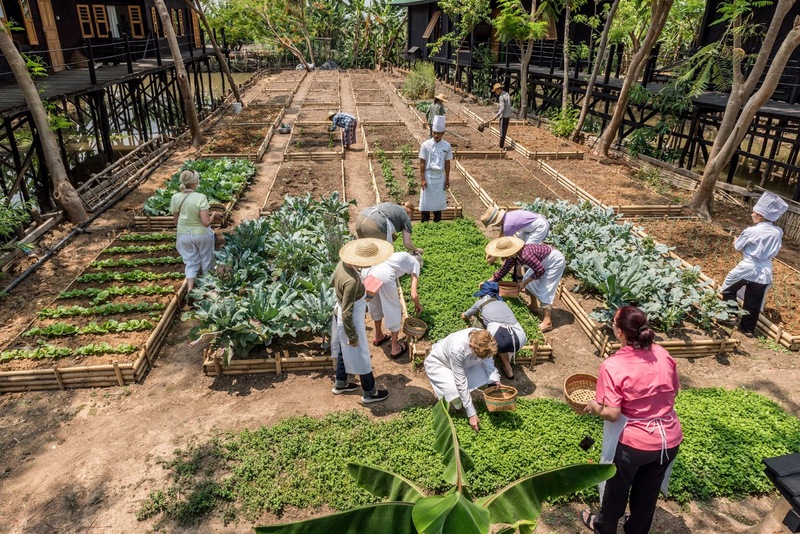 The Inle Heritage House is more than a cooking school. It's training ground for young locals who want to work in the hospitality business. Aside from the restaurant and cafe where we ate what we cooked, the complex has a cat sanctuary. Although I'm not a cat person, it was such a treat to see real Burmese cats napping at the same time. All photos and video by the author except when noted.